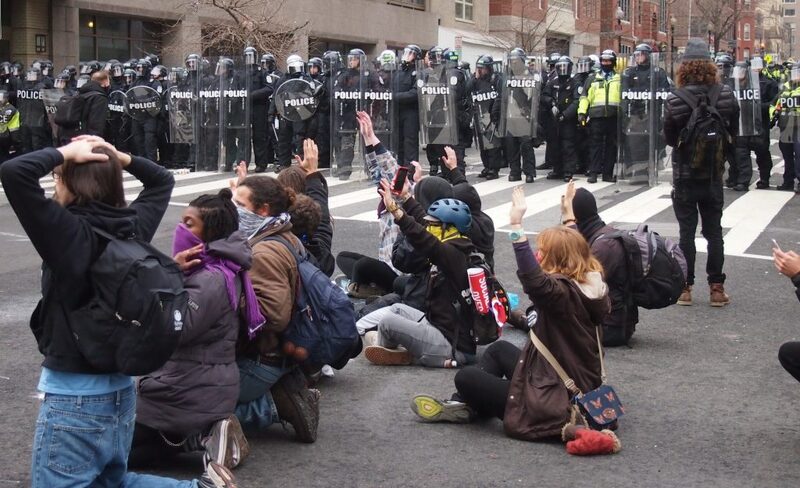 Criminal hearings began earlier this month for the more than 230 protesters facing felony charges for destruction of property and conspiracy to riot, based on events that transpired on Jan. 20—the day of President Donald Trump’s inauguration. For many of these so-called “J20” protesters, the charges could total 70 years or more of prison sentences. The district attorney’s office has charged all of the protesters, even though there is little evidence of criminal wrongdoing for the majority. On the day of Trump’s inauguration, hundreds of activists took to the streets in protest of the incoming administration, including members of anti-fascist protest groups and the Black Bloc. Throughout the day, police and protesters clashed, and there were cases of property destruction by demonstrators, including smashing windows and ATMs and setting a limousine on fire. The police carried out mass arrests of demonstrators and bystanders alike, including journalists, medics, and legal observers. Police detained over 230 people in 36 hours throughout the weekend. The entire group was charged with felony conspiracy to riot. Three months later, on April 27, 212 people—some of whom had not been charged previously—were charged on additional counts, threatened with decades behind bars. This editorial board believes that by charging all of the demonstrators with blanket charges, prosecutors are acting unjustly and setting a dangerous precedent for the future of political protest. The district attorney should prosecute those against whom there is a strong case, and guilty individuals should face punishment for destructive crimes. But as they stand, the charges arbitrarily group over 200 individuals on the pretense of inciting a riot, when in reality, most of them were arrested simply for proximity to the crimes. These charges are a gross violation of justice and the rule of law. Beyond the logic that it does not take over 200 people to cause the damage that was done, many of the people who face charges had no apparent link to rioting crimes besides proximity. While the DA’s office is well within its rights to prosecute those against whom there is a clear case, it is obvious that the majority of these cases are baseless. Taking them to court is a waste of public resources and puts an unfair financial and time burden on the defendants. Still, the DA is choosing to go ahead with these cases, thereby planning a clear miscarriage of justice. These blanket charges are an obvious scare tactic meant to dissuade further activism and protests. By setting the precedent that bystanders can face legal repercussions for simply being in the presence of criminal activity while protesting, prosecutors are endangering all future forms of activism. Around the country, laws are being introduced at an alarming rate that attack the rights of protesters, and the prosecution of J20 demonstrators is clearly in line with this dangerous trend. Prosecuting these demonstrators will set a precedent against protesters around the country which will almost certainly be used time and again against Americans demonstrating their First Amendment rights. These blanket charges are nothing more than—and nothing short of—an attack on the rights to free speech and protest, rights that are crucial to a successful democracy. They are a clear scare tactic to prevent other activists and organizers from making their voices heard. Even more, they threaten over 200 Americans with excessive jail time, mostly for nothing more than wearing black and being near criminals. This possibility is an indictment on the DA’s office and the American system of justice.